Any reports from the AR river valley, Lake Dardanelle. I am finally going to have some time to get my dog and I out in the water. I have an 1860 alumacraft with all deck-space (3 hunters + gear). Me & my son (14) need a hunting buddy who might want to combine efforts and find the mystery-ducks this year (3 weeks left!). I am wanting to go to Pendleton, Altheimer, areas like that where one can boat to hard-to-reach places, then tie off and walk in a bit. Any thoughts on all the above? LITTLE ROCK – One of the coldest mid-November weeks on record is stirring excitement among the state’s duck hunters as opening day looms. That excitement, however, is tempered somewhat by a shortage of hunting water in many areas. Duck season opens 30 minutes before sunrise Saturday, and Arkansas is coming off an extended bout of unseasonably cold weather, which typically bodes well for duck hunting as habitats to the state’s north become snow-covered and frozen. The National Weather Service was projecting Little Rock’s average daily temperature to be 34.9 degrees for the period spanning Nov. 12-18, which would mark the lowest average temperature on record for that span. But even as temperatures have dropped, rainfall has been scarce in many areas, leaving many naturally flooded waterfowl habitats dry. Waterfowl survey results should be available in time for next week’s weekly waterfowl report and will be posted on the AGFC website at http://www.agfc.com, but preliminary observations seem to indicate a higher-than-average percentage of mallards in the population estimate. Observers reported large concentrations of ducks at Big Lake National Wildlife Refuge and Lake Ashbaugh in northeastern Arkansas. Hunted near jonesboro yesterday… killed 9 (2 Ross’ and 7 S&B’s) very tough right now. Birds are strung out from Stuttgart to SEMO with few large concentrations. This weird winter up and down temp weather has them strung out… Hope they start moving some after next weeks winter mix forecasts. Gonna try again in a week or so. Ice, snow, and cold rain… not good! Birds are holding south of us… Maybe we can get them into the area with this weekend’s warm up! LITTLE ROCK – With less than two weeks left in the 2013-2014 duck season, the latest duck numbers offer cause for optimism among the state’s hunters. Arkansas Game and Fish Commission biologists flew the annual Midwinter Survey Jan. 6-8 and estimated just over 927,000 total ducks in the state’s Delta, including more than 807,000 mallards (nearly 90 percent of the total). The total duck and mallard estimates both fell below the five-year averages for the Midwinter Survey, but both population estimates increased from the last aerial waterfowl survey in December. The estimated mallard population was more than double the December 2013 mallard estimate and also double the mallard total from the Midwinter Survey period a year ago. The current population estimate of more than 807,000 mallards is the second highest mallard count since the AGFC began systematic aerial surveys five years ago. While the total Delta duck estimate of roughly 927,000 was well below the roughly 1.4 million duck average over the past five years, it’s important to note that the survey took place during a period of extreme cold temperatures that gripped Arkansas the second week of January. The cold conditions limited habitat availability and confined ducks to major river floodplains and other moving water that remained unfrozen. 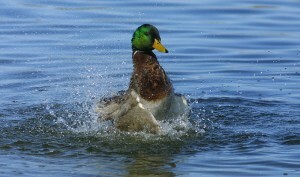 In southwest Arkansas, observers counted an estimated 36,000 total ducks, about half of which were mallards. Weather conditions prevented a survey in the Arkansas River Valley; it is being conducted this week. Habitat conditions remain very good across much of the state, with most wildlife management areas with green-tree reservoirs being fully flooded. Ample rainfall this month also has created abundant habitat in agricultural fields across the Delta. Temperatures are forecast to stay near or slightly above seasonal averages for the next week. Hunted Wildlife Farms in Casscoe this morning and five us managed one limit plus a wood duck. We only saw two or three more groups of big ducks but most were either too high or far away to work. Had a teal and a group of ringnecks buzz the blind but never offered a good shot. The weather was great and the accomodations and food were nothing short of fantastic! Thanks again to our guides….Colby and Blake! The Duck Blind Sammich was the bomb! Hope to be back next year! Starting yet another road trip to Arkansas to close with and destroy the enemy by fire or maneuver. My query is very elusive and many factors go into the consideration to locate the perfect storm scenario. We enjoy the challenge and welcome the new comradeship we will experience from time to time with those that share our trade. I plan to keep you posted on our endeavors has we go where the foe is located. You are welcome to join us, or inquire of what we are doing that is working. See to me if over a 10 day period in Arkansas we (2) in my party have 1 or 2 limit out days that has been a successful trip. Where are you going you may ask? Well depending on the RECON its looking we may start on the Cache – DD – Rainey Brake depending on water levels. We are strictly boat scenario style hunters which allows tremendous flexibility to stay on or go to the ducks. LITTLE ROCK – Arkansas’s duck season has been closed since Sunday for the first split of the 2013-2014 season, and a big dose of extremely cold air, as well as winter weather, is expected to greet hunters as the season resumes. The second segment of the season opens Thursday, just as an Arctic cold front is expected to make its way into the northwestern part of the state. By the weekend, weather forecasters predict much of Arkansas will be gripped by sub-freezing temperatures and a mix of icy precipitation. Winter storm warnings or watches have been issued for the northern two-thirds of the state, although forecasters haven’t ruled out the possibility of icy weather in southern sections, as well. Plummeting temperatures and snowfall in more northern areas could lead to a large migration movement of mallards and other dabbling ducks from areas such as Missouri, Illinois, Iowa, Kansas and Nebraska. Following the passage of the front, high temperatures at Little Rock are expected to be at or just above the freezing mark for the next week, with nighttime lows dipping into the teens and 20s. Some public-land hunting areas, including the popular Bayou Meto Wildlife Management Area, have benefited from recent rainfall, but some areas still are in need of more rainfall to reach target water levels. Liquid precipitation and melting frozen precipitation may help to improve habitat conditions following the winter storm system’s passage. 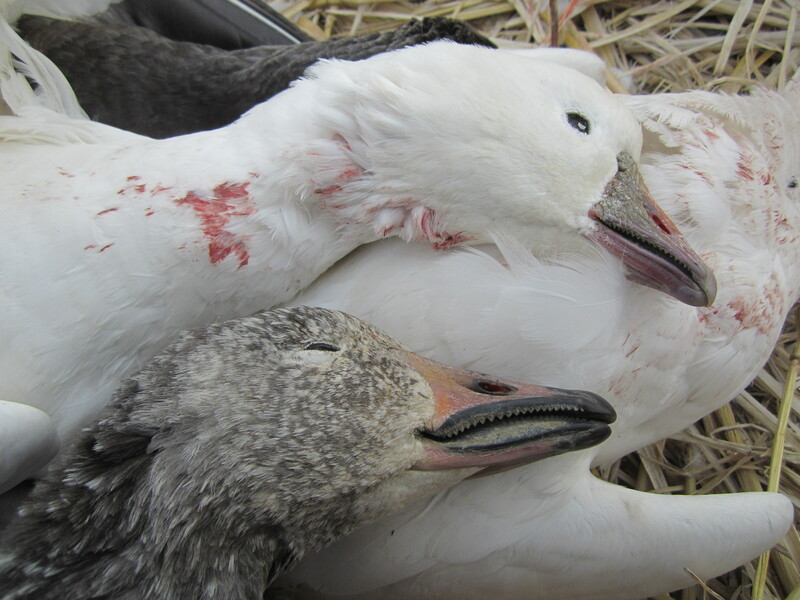 Reports of a Speckle Belly Goose migration and started flooding in on Friday on the DU Migration Report. Reports of hearing Specks at/all night began coming in on Friday evening and went on through the weekend with a few Snow Geese also heard.